The numbers tell the story for the Buffalo Bandits’ offense. 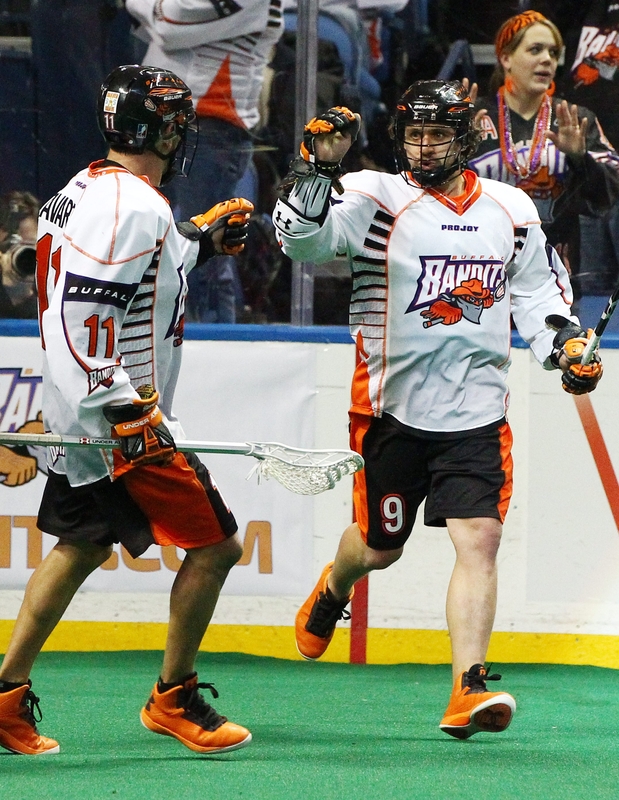 When the Bandits were 8-2 back in mid-March, the team was averaging 11.9 goals per game and allowing 10.1 goals. But since then, Buffalo has scored only 8.1 goals per game while allowing 11.9 goals. That’s led to the most discouraging number of them all – seven straight losses, a franchise record. The Bandits go in search of that spark again tonight in First Niagara Center. They will host the Rochester Knighthawks in the final game of the regular season (7:30 p.m., nll.com, Radio 1520 AM). General Manager Steve Dietrich points out that things haven’t gone according to plan on offense this season. “When we put it all together, it just hasn’t meshed,” he said. “I don’t know if our left side all wants to play the same role, or if no one is adapting to play different roles. The group on the floor hasn’t meshed. We thought Mitch Jones added a different dimension, and the coaching staff decided to play him out the back door last week – where he did a remarkable job. We brought in Joel Matthews last week, and he did a great job of creating some space. Resetarits has been the Bandits’ most consistent scorer lately. He is tied for second on the team with John Tavares for goals with 23, and he has goals in the team’s last 11 games. Meanwhile, Steenhuis leads the team in goals with 27. He didn’t need much time to become familiar with playing offense again after spending much of the past few seasons on defense. “Not bad, but you can always do better,” he said in assessing his play. The Bandits naturally aren’t happy with the way the team has played in the past six weeks. The way out doesn’t include having a sense of panic, and Steenhuis said that issue has not come up. “We do have to commend the coaching staff for that,” he said. “They are keeping the attitude in high spirits. In years past, like last year, we were in a hole and just tried to dig ourselves out. There’s more enlightenment around this time. The guys are still loose. The atmosphere has been nice. The Bandits have clinched a playoff spot, but have missed a few chances during this losing streak to wrap up second place in the National Lacrosse League East – and with it a home game in the first round of the playoffs. Now, it would take either a win over Rochester tonight or a loss by Toronto in Minnesota this evening in order for Buffalo to return home to play the Rock in the postseason next week. The Bandits lost six in a row down the stretch and sat out the playoffs in 2013. Having that postseason spot wrapped up might make the team more relaxed tonight. Buffalo is 6-2 at home, 2-7 on the road this season. Playoff implications are fine, but the Bandits have a more primary goal in front of them. No one wants to go into the postseason on an eight-game losing streak.